So… Hawthorn. This isn’t an easy conversation. You’ve been there for me since I started posting squiggle stuff on BigFooty. You camped out among the premiership cups for months on end. You were a pleasure to watch and easy to predict. It’s even easy to identify the moment it all went wrong for Hawthorn: Round 6, April 30, 2016, 4:35pm. That was when the Hawks, travelling at 4 wins and 1 loss after a series of narrow escapes, ran into GWS and started watching footballs flying over their heads. They lost by 75 points. It was the beginning of the end because if there was one thing the Hawks made clear during their period of dominance, it was that good teams don’t get thrashed. Thrashings are very indicative. Squiggle pays a lot of attention to them, even more than wins. Very good teams don’t receive them, under any circumstances, not even when nothing’s going right. They cough up close losses but not thrashings. And they belt bad teams. Adelaide and GWS did what was expected, while Sydney had another bad week — again, not because their performance was so terrible, but because when you can only afford to lose 5 or 6 games for the year to make the top 4, it’s not great to accumulate three of them before your first win. They’re still rated the third-best team, but they probably need to go 16-3 from here, and that’s a huge ask. A good week for the Cats, mainly because Sydney and the Bulldogs’ troubles freed up some breathing space in the top 4. Also good for Collingwood, who banked a win that few would have counted on, and stole ground from top-8 competitors in Hawthorn, Melbourne, and North. Carlton and Essendon take a step to the right, mainly because of a heavily rain-affected game. But Fremantle overtake both after beating the Bulldogs. The Tigers are now 3-0, but squiggle isn’t too excited yet. They’re a genuine finals chance, currently predicted to miss out on percentage only, but their results have been only mildly better than expectation. To really move, they need to belt Brisbane next week. It’s quite possible to get out to a slow start and have a successful season, and the conditions seem to be as good in 2017 as they have been in any other recent year. The introduction of future draft pick trades in 2015 has given us, the footballing public/nerds, the wonderful spectacle of clubs quite literally taking bets on each other and then “death-riding” them the following year in the hopes of securing a better pick. Not as much dramatic squiggling this week, with most results falling somewhere around expectations. But a great one to be a Port Adelaide fan! I may be going early on that. That isn’t really a sure thing. But right now there are seven teams who will probably be playing finals, plus a whole mess of teams who might. 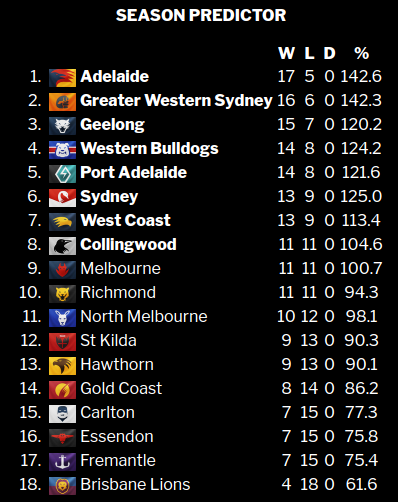 The other top 6 teams – Adelaide, the Bulldogs, GWS, Sydney, and West Coast – also had pretty good weeks, or least not terrible ones. But that’s the problem: they all did. So no-one stole a break. The Crows, for example, would be very happy with their win over the Hawks, but even though GWS’s 102-point demolition of Gold Coast proved that Adelaide’s Round 1 victory really meant something, so too did it confirm that the Giants are a serious obstacle to the flag. So it’s a good news/bad news situation. The Swans and Cats are an interesting pair. You would probably rather be Sydney, who put up a good fight against the Bulldogs despite a raft of injuries. But the fact that Geelong are now 2-0 while Sydney are 0-2 is starting to bite. There isn’t usually much room for error at the top of the ladder, so although Sydney are rated the better team, the question becomes whether they’re so much better that they can overtake the Cats after giving them a 2-win head start. North Melbourne had about as good a week as you can have when you lose by one point. 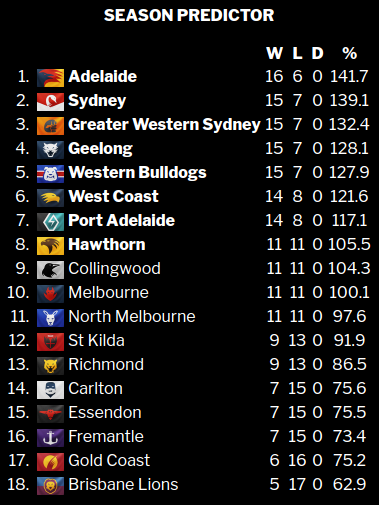 And Gold Coast had about as good a week as you can have when you lose by 102, because Fremantle and Brisbane showed they’re bad enough to compete for the spoon, and Carlton doesn’t look like breaking out of the bottom 4, either. Not much action on Flagpole this week, since it already loved Adelaide, and expected nothing less from them than what they delivered. 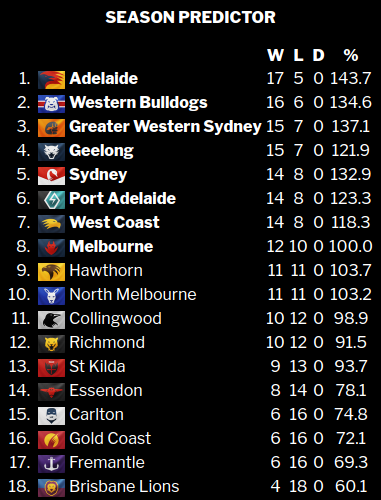 But a handy bump for the Giants, Bulldogs, and Port. For more: Live squiggle! – Squiggle dials! Two more articles on what early results really mean. Here’s a version of that graph extended to the full home-and-away season. Cool, IMO. 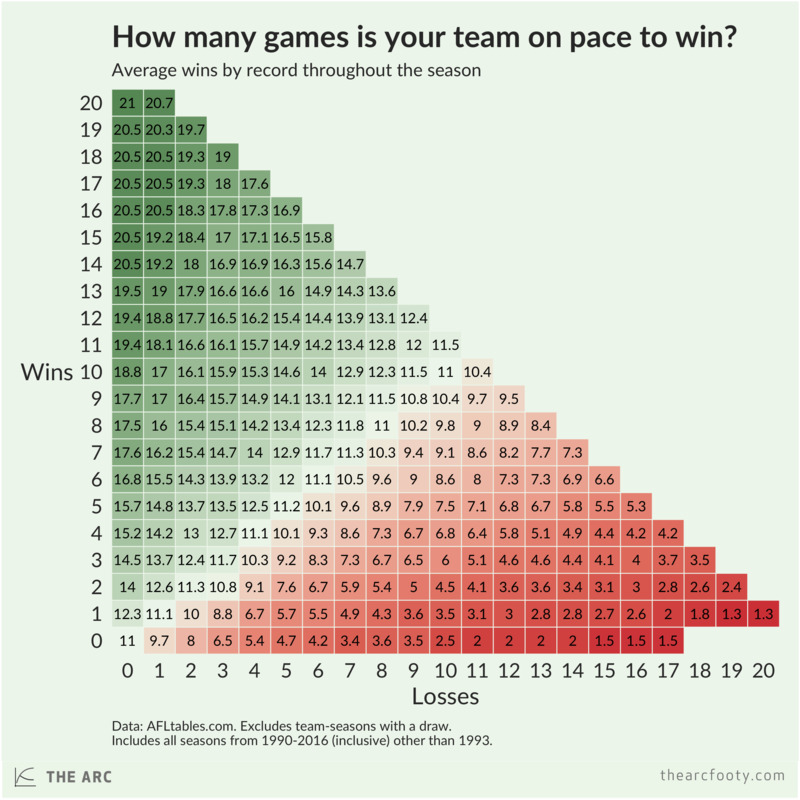 Using this chart, you can look up how many games your team is on pace to win for the year. 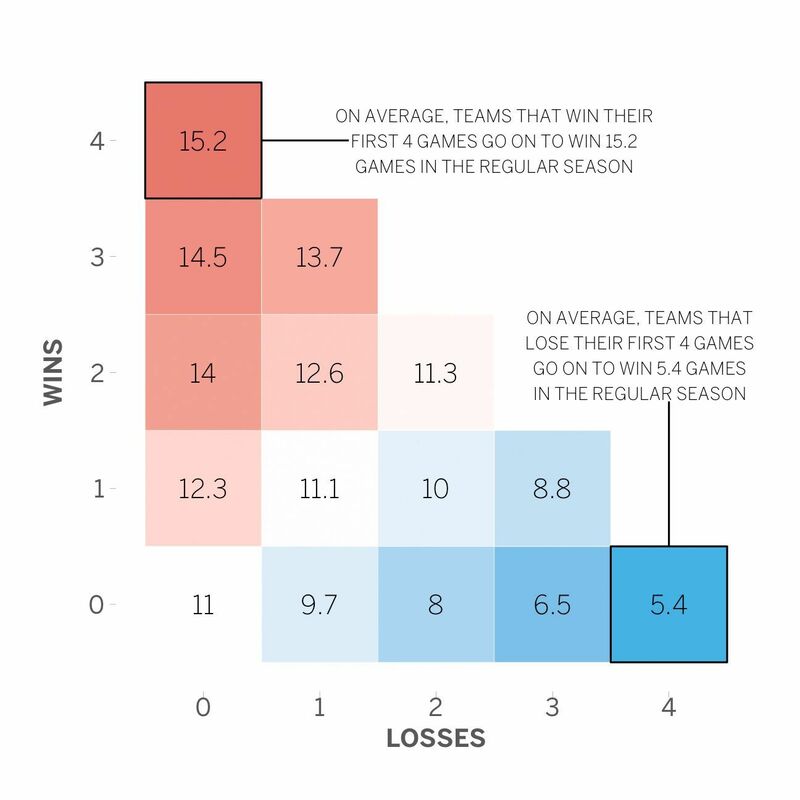 For example – if your team has won 6 from their first 9 (a 6-3 record), then they’re on pace to win 13.9 for the year – enough to comfortably make the finals. We have considered two classes of results: eventual finalists beaten in round one by teams who missed the finals, and eventual finalists beaten by other finalists who finished lower down the ladder. Source: What does winning in round 1 mean? How important are early wins? 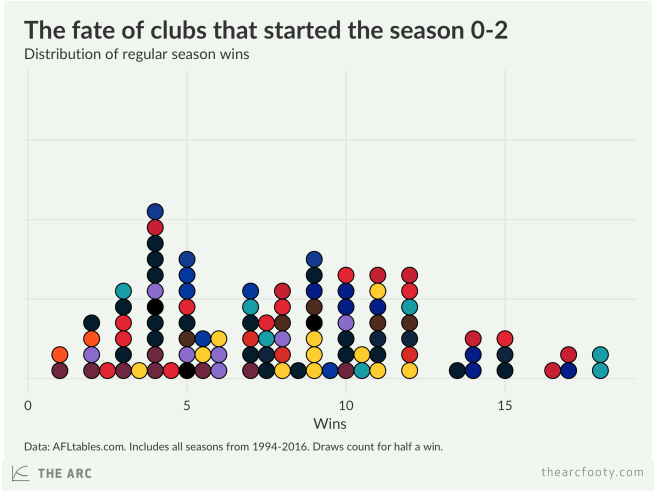 Think it’s okay for your club to slowly work its way into the season? Think again. 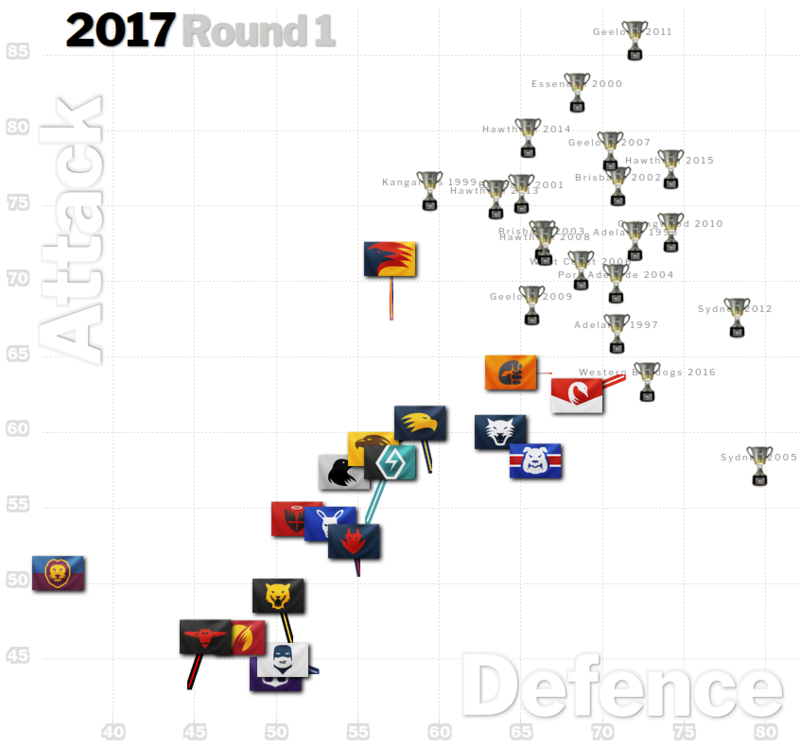 Statistics show the early rounds do more than any other point in the season to set teams on a path to finals – or not. What’s better than beating the premiership favourite by 56 points? Doing it while the second premiership favourite goes down in a screaming heap at home to Port Adelaide! Last year, the Squiggle had a torrid love affair with the Crows, who offered a blistering attack of the kind the squiggle can’t resist, and then, just when it seemed like all sizzle and no steak, and the squiggle’s friends were like, “He’s no good for you, he can’t be trusted, and he rides a motorcycle,” began delivering solid defensive efforts as well. 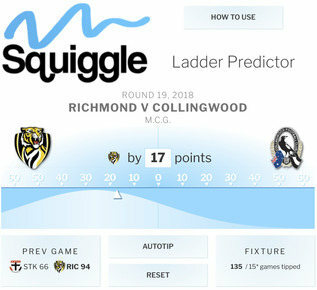 Adelaide were Squiggle’s Flagpole pick from mid-season right up until Round 23, when a catastrophic home loss to West Coast dumped them from 2nd to 5th. And two finals later, they were gone. But now they’re back! And doing the exact same thing, lifting off vertically, by scoring more than expected while holding their opponent in check. There are four teams there all on 11 predicted wins from 8th to 11th, so that will change very easily. West Coast, Melbourne, and Richmond also had great weeks. In particular, they kicked big scores, even moreso than the rest of the competition. That’s a bit of a Round 1 trend; at least, if two years including this one can make a trend. Last year it faded away, with average scores winding up only a little above the long-term average. Gold Coast’s week was the worst, despite the big comeback, since they dropped a game to the wooden spoon favourite and probably had the most disappointing result of the bottom 6. 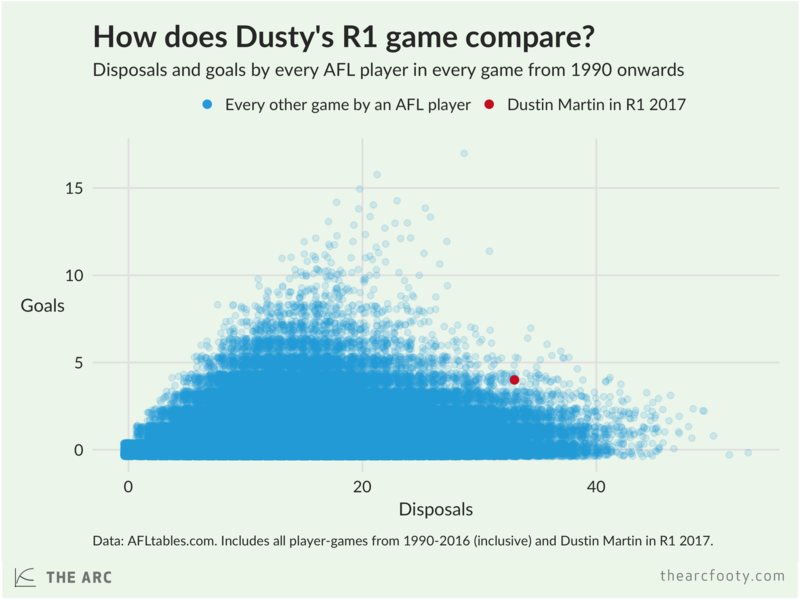 But Hawthorn’s was pretty bad, too. Flagpole! This is a premier predictor that rates performances based on how similar they are to those from past premiership-winning teams. 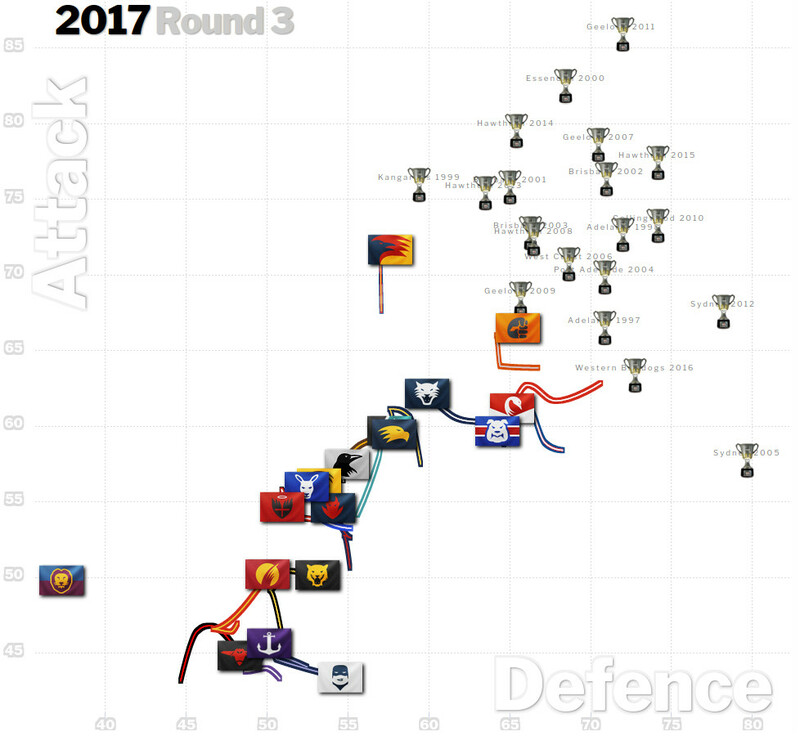 In practice, this mostly means that it cares more about attack than defense, since attacking teams have won a lot of flags over that period, while defensive teams have been coached by Ross Lyon. P.S. Sorry for the graphical glitchiness that makes GWS and Adelaide’s squiggle lines a bit thin this week. Will be better next week.